Recent trends in work/life balance are transforming the modern office. Sitting in a neighbor's barn during August may not seem like the ideal working conditions for you. In fact - depending on the barn - it could be downright unbearable. But many barns are comfortable buildings with clean wood finish and natural ventilation, potentially perfect for any type of office work. New waves of companies are repurposing buildings and converting them to office space while others are heading for the cloud, giving their employees complete freedom from their walls. The historic Bridge Building, pictured above, is a beautiful example of building reclamation in Nashville, TN. Writers have embraced this freelance lifestyle for centuries. Thoreau's Walden, Virginia Woolf's shed at Monk's House, and Henry Miller's isolated library (pictured below) have all provided a place for each author to explore their creative abilities. It's no wonder so many among us fancy being a writer - escaping to a sanctuary of personal space to be ourselves. Around the world people are waking up to the brilliant idea of enjoying life's work, finding what tasks bring them joy. Part of that has been coming to grips with where that work takes place. Entire companies are run over the cloud from remote locations around the globe. Entrepreneurs no longer need entire garages but only a small seat with a decent view. With the number of remote employees increasing and the need for large office complexes diminishing, a new wave of work-space is developing; the tiny office. 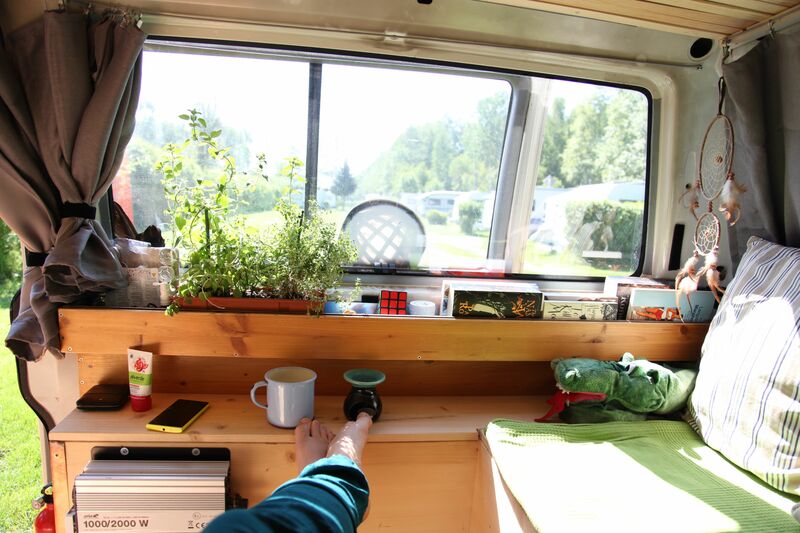 A broad category that includes mobile vehicles and garden pods alongside carved-out interior space and tiny homes, tiny offices are normally born out of necessity. They invite our imagination to create exactly what we need - personal space. Your space is the only thing truly yours. Where you reside in this, and every moment, is what defines you as a person. Picture yourself working, where is your work-space? Many people may instantly conjure images of their office or place of work, surrounded by the people they work with and of the same layout and decor they're used to. Others may picture their ideal. Maybe on a beach or in the mountains somewhere. Regardless of what your initial thoughts are, take a deeper look at yourself in that space. What about it is yours? If you're fortunate to work from home you may say "Ha, all of it." And you would be right, but is it your ideal? Now imagine yourself doing just what you want with your life's work. Close your eyes and really picture yourself. Then picture your tools. Now a window. Pause and place yourself in an enclosed space of comfort and retreat. I wonder where you are right now and how much the rent is. As costs of offices continue to increase, companies are questioning the very necessity of them - when many people would prefer to work closer to their home in a more private, comfortable setting. A setting more like their home. According to Forbes magazine, 1 in 5 people now work from home in the United States. Many employees are given the option to telecommute for part of the week and some companies are allowing extremely flexible work hours. Employment is changing and people's lives are changing with it. Not without its downsides - Working remotely on a flexible schedule sounds great until you're scrambling to finish a deadline by midnight because your dog went missing for 3 hours. No doubt the largest complaint of working from home is domestic distraction. Anyone who has been there can vouch, the things you care about most - the very things you work for - will distract you from your work tasks. Enter the tiny office: your place to retreat with your life's work. A space all your own where you can develop a routine and maintain a comfortable work/life balance. Whether it's a shed like Roald Dahl's or a minibus with a Subaru engine in it, your work-space can define how and when you work. Some of what you decide will be limited by the confines of your property - or means to purchase - but that should not deter you. There is always room for innovation, no matter the means. Tiny office spaces are limited only by your imagination - especially if you're willing to get dirty and build it yourself. Otherwise, below are three great prefab options to help you carve out that space with a couple of clicks - and a few thousand dollars. 1. - UK-based OfficePOD sets the standard in prefab tiny office spaces. An artfully designed unit that can be easily disassembled and moved, each pod offers the benefits of modular construction along with customizable features. With a range of roughly 24-78 sq. ft. OfficePOD has seven sizes to choose from, each laid out in a unique way to fit your working style. If space is a concern, the OfficePOD is a great way to go - above is their 2.0 model nestled into a narrow garden courtyard. 2. - Another take on the pod concept for home offices is done by Robust Outdoor Brands. A Swiss company with a monolithic dome design, these buildings make a statement and blend in beautifully with nearly any surrounding. The rounded corners and spacious interior give you the freedom to place these prefabricated pods in numerous locations. Four different sizes and several customization options help to make these monolithic structures your own personal escape. The Menhir model of PODhouse from ROB, pictured above, blends in well with natural environments and can be outfitted with all of the modern conveniences you may need to pursue your work. 3. - Studio Shed, has embraced the culture of shed work and tiny offices maybe the best of all. Their blog is full of success stories for those looking to be inspired by this freedom movement. And their buildings can be customized for the type of work you do. With models for music, art, office, and wellness - these sheds aren't your run of the mill outbuilding. They're built to last and to help you stay comfortable no matter how you work. Moreover, they offer a do-it-yourself option for those of you who want to save some dough but need guidance along the way. A well designed, customizable building that can be made to match many different styles - the Signature Series from Studio Sheds can be a beautiful addition to your property. Pictured above is the unassuming exterior with the spacious, and tasteful, interior below. Finally, there's always the salvage yard. Many folks are taking this tiny office idea into their own hands and building incredible spaces, fully customized to their property and their unique style of work. What better way to engrain yourself in your passion than tobuild a space - to create it with your own two hands? This could just be a project that launches you into a shifting mindset of where, and how you work. Find your space and make your life's work a joy instead of a drag. A tiny office, or even a place all your own within a building, can make that work exponentially more enjoyable - helping you find comfort in a routine and giving birth to an entirely different way to approach your work/life balance.